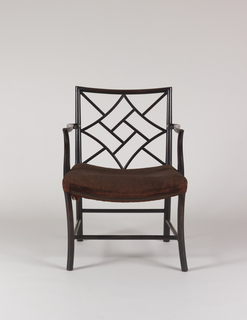 A side chair with a rectangular back filled with a lattice-work of curved members. Its curved arms are supported on shaped stumps secured to side rails. Round rear legs; "cluster" front legs. Two lateral and two longitudinal stretchers. 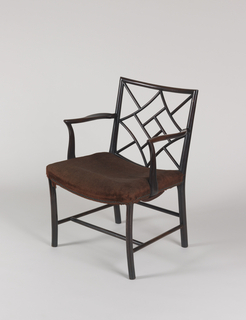 Hollowed seat upholstered in brown wool. Described as "cockpen" armchairs.